Tonight, I think first of those who helped get me here - starting with the people of Tennessee. Then, those who braved the first snows of Iowa and New Hampshire -- and all of you here, from all over this country, who have come with me into the warm sunlight of this great city. While I can't thank each of you individually in words, I do so in my heart. And I know you won't mind if I single out someone who has just spoken so eloquently, someone I've loved with my whole heart since the night of my high school senior prom -- my wife, Tipper. We've been lucky enough to find each other all over again at each new stage of our lives - and we just celebrated our 30th wedding anniversary. And the youngest member of our family, who a little over a year ago was born on the Fourth of July -- our grandson Wyatt. I'm honored tonight by the support of a leader of high ideals and fundamental decency, who will be an important part of our country's future -- Senator Bill Bradley. The next Vice President of the United States, Joe Lieberman. I picked him for one simple reason: he's the best person for the job. For almost eight years now, I've been the partner of a leader who moved us out of the valley of recession and into the longest period of prosperity in American history. I say to you tonight: millions of Americans will live better lives for a long time to come because of the job that's been done by President Bill Clinton. Let's not forget that a few years ago, you were also working hard. But your hard work was undone by a government that didn't work, didn't put people first, and wasn't on your side. But now we turn the page and write a new chapter. And that's what I want to speak about tonight. I'm not asking you to vote for me on the basis of the economy we have. Together, let's make sure that our prosperity enriches not just the few, but all working families. Let's invest in health care, education, a secure retirement, and middle class tax cuts. I'm happy that the stock market has boomed and so many businesses and new enterprises have done well. This country is richer and stronger. But my focus is on working families - people trying to make house payments and car payments, working overtime to save for college and do right by their kids… Whether you're in a suburb, or an inner-city… Whether you raise crops or drive hogs and cattle on a farm, drive a big rig on the Interstate, or drive e-commerce on the Internet… Whether you're starting out to raise your own family, or getting ready to retire after a lifetime of hard work. So often, powerful forces and powerful interests stand in your way, and the odds seemed stacked against you -- even as you do what's right for you and your family. How and what we do for all of you - the people who pay the taxes, bear the burdens, and live the American dream -- that is the standard by which we should be judged. I want you to know this: I've taken on the powerful forces. And as President, I'll stand up to them, and I'll stand up for you. I want you to know: I believe we must challenge a culture with too much meanness, and not enough meaning. And as President, I will stand with you for a goal that we share: to give more power back to the parents, to choose what your own children are exposed to, so you can pass on your family's basic lessons of responsibility and decency. We could squander this moment - but our country would be the poorer for it. Instead, let's lift our eyes, and see how wide the American horizon has become. And of all the lessons my parents taught me, the most powerful one was unspoken -- the way they loved one another. They simply couldn't imagine being without each other. And for 61 years, they were by each other's side. My parents taught me that the real values in life aren't material but spiritual. They include faith and family, duty and honor, and trying to make the world a better place. I finished college at a time when all that seemed to be in doubt, and our nation's spirit was being depleted. We saw the assassination of our best leaders. Appeals to racial backlash. And the first warning signs of Watergate. I remember the conversations I had with Tipper back then - and the doubts we had about the Vietnam War. But I enlisted in the Army because I knew if I didn't go, someone else in the small town of Carthage, Tennessee would have to go in my place. I was an Army reporter in Vietnam. When I was there, I didn't do the most, or run the gravest danger. But I was proud to wear my country's uniform. When I came home, running for office was the very last thing I ever thought I would do. I studied religion at Vanderbilt, and worked nights as a police reporter at the Nashville Tennessean. And I saw more of what could go wrong in America - not only on the police beat, but as an investigative reporter covering local government. I also saw so much of what could go right - citizens lifting up local communities, family by family, block by block, neighborhood by neighborhood, in churches and charities, on school boards and City Councils. And I decided that I could not turn away from service at home - any more than I could have turned away from service in Vietnam. That's why I ran for Congress. In my first term, a family in Hardeman County, Tennessee wrote a letter and told how worried they were about toxic waste that had been dumped near their home. I held some of the first hearings on the issue. And ever since, I've been there in the fight against the big polluters. On the issue of the environment, I've never given up, I've never backed down, and I never will. In the Senate and as Vice President, I fought for welfare reform. Over and over again, I talked to folks who told me how they were trapped in the old welfare system. I saw what it did to families. So I fought to end welfare as we then knew it - to help those in trouble, but to insist on work and responsibility. For almost 25 years now, I've been fighting for people. And for all that time, I've been listening to people - holding open meetings, in the places where they live and work. And you know what? I've learned a lot. And if I'm your President, I'm going to keep on having open meetings all over this country. I'm going to go out to you, the people, because I want to stay in touch with your hopes; with the quiet, every-day heroism of hard-working Americans. I met Mildred Nystel in Waterloo, Iowa. Because of our welfare reform, she's left welfare and found a good job training electricians - and she's become a proud member of IBEW Local 288. Now she dreams of sending her daughter Irene to college. I met Jacqueline Johnson in St. Louis, Missouri. She worked for 35 years as a medical assistant, caring for others. Now she's 72 years old and needs prescription medicines to care for herself. She spends over half of her Social Security check - her only source of income - on her pills. So she either skips meals, or shops for bargains at a wholesale food store and buys macaroni and cheese dinners in bulk - and then has them at every meal. It's just wrong for seniors to have to choose between food and medicine while the big drug companies run up record profits. You know, education may be a local responsibility. But I believe it also has to be our number-one national priority. We can't stop until every school in America is a good place to get a good education. And I will never forget a little boy named Ian Malone - who suffered from a medical mistake during childbirth, and needs full-time nursing care for several years. I met him and his parents in Seattle, near their home in Everett, Washington. Their HMO had told the Malones it would no longer pay for the nurse they needed, and then, told them they should consider giving Ian up for adoption. That's when his mom and dad got really mad. They told their story in public, and the HMO was embarrassed. Because they fought for their baby , today Ian has the care he needs to stay alive. But no family in America should have to go on national television to save their child's life. Dylan and Christine Malone are here with us tonight. Ian's here, too. And I say to them, and to all the families of America: I will fight for a real, enforceable Patients' Bill of Rights. It's just wrong to have life and death medical decisions made by bean-counters at HMO's who don't have a license to practice medicine, and don't have a right to play God. It's time to take the medical decisions away from the HMO's and insurance companies - and give them back to the doctors, the nurses, and the health care professionals. So this is not just an election between my opponent and me. It's about our people, our families, and our future - and whether forces standing in your way will keep you from having a better life. It's about millions of Americans whose names we may never know - but whose needs and dreams must always be our calling. And so here tonight, in the name of all the working families who are the strength and soul of America -- I accept your nomination for President of the United States. I'm here to talk seriously about the issues. I believe people deserve to know specifically what a candidate proposes to do. I intend to tell you tonight. You ought to be able to know, and then judge for yourself. If you entrust me with the Presidency, I will put our democracy back in your hands, and get all the special-interest money - all of it - out of our democracy, by enacting campaign finance reform. I feel so strongly about this, I promise you that campaign finance reform will be the very first bill that Joe Lieberman and I send to Congress. At a time when most Americans will live to know even their great-grandchildren, we will save and strengthen Social Security and Medicare - not only for this generation, but for generations to come. At a time of almost unimaginable medical breakthroughs, we will fight for affordable health care for all - so patients and ordinary people are not left powerless and broke. We will move toward universal health coverage, step by step, starting with all children. 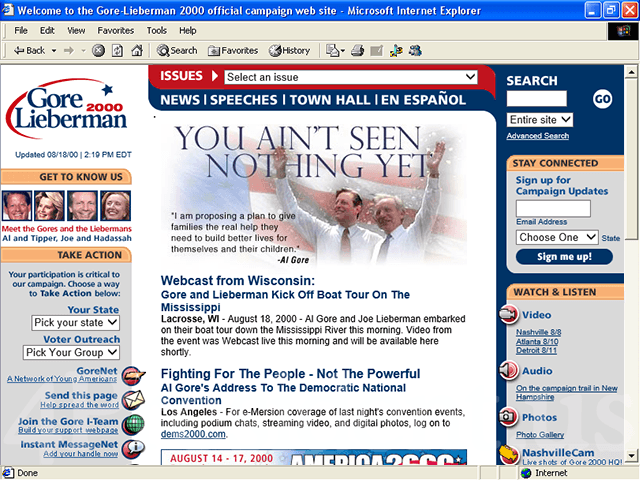 Let's get all children covered by the year 2004. And let's move to the day when we end the stigma of mental illness, and treat it like every other illness, everywhere in this nation. Within the next few years, scientists will identify the genes that cause every type of cancer. We need a national commitment equal to the promise of this unequalled moment. So we will double the federal investment in medical research. We will find new medicines and new cures - not just for cancer, but for everything from diabetes to HIV/AIDS. For revolutionary improvements in our schools. For higher standards and more accountability. To put a fully-qualified teacher in every classroom, test all new teachers, and give teachers the training and professional development they deserve. It's time to treat and reward teachers like the professionals they are. It's not just about more money. It's about higher standards, accountability -- new ideas. But we can't do it without new resources. And that's why I will invest far more in our schools - in the long-run, a second-class education always costs more than a first-class education. This nation was a pioneer of universal public education. Now let's set a specific new goal for the first decade of the 21st Century: high-quality universal pre-school - available to every child, in every family, all across this country. And all of this - all of this -- is the change we wish to see in America. Not so long ago, a balanced budget seemed impossible. Now our budget surpluses make it possible to give a full range of targeted tax cuts to working families. Not just to help you save for college, but to pay for health insurance or child care. To reform the estate tax, so people can pass on a small business or a family farm. And to end the marriage penalty - the right way, the fair way -- because we shouldn't force couples to pay more in income taxes just because they're married. About 62 cents in change. Let me tell you: that's not the kind of change I'm working for. I'll fight for tax cuts that go to the right people - to the working families who have the toughest time paying taxes and saving for the future. I'll fight for a new, tax-free way to help you save and build a bigger nest egg for your retirement. I'm talking about something extra that you can save and invest for yourself. Something that will supplement Social Security, not be subtracted from it. But I will not go along with any proposal to strip one out of every six dollars from the Social Security trust fund and privatize the Social Security that you're counting on. That's Social Security minus. Our plan is Social Security plus. But there's something at stake in this election that's even more important than economic progress. Simply put, it's our values; it's our responsibility to our loved ones, to our families. And to me, family values means honoring our fathers and mothers, teaching our children well, caring for the sick, respecting one another -- giving people the power to achieve what they want for their families. Putting both Social Security and Medicare in an iron-clad lock box where the politicians can't touch them -- to me, that kind of common sense is a family value. A new prescription drug benefit under Medicare for all our seniors - that's a family value. And let me tell you: I will fight for it, and the other side will not. They give in to the big drug companies. Their plan tells seniors to beg the HMO's and insurance companies for prescription drug coverage. And that's the difference in this election. They're for the powerful, and we're for the people. Big tobacco, big oil, the big polluters, the pharmaceutical companies, the HMO's. Sometimes you have to be willing to stand up and say no - so families can have a better life. I know one thing about the job of the President. It is the only job in the Constitution that is charged with the responsibility of fighting for all the people. Not just the people of one state, or one district; not just the wealthy or the powerful -- all the people. Especially those who need a voice; those who need a champion; those who need to be lifted up, so they are never left behind. There's one other word we've heard a lot of in this campaign, and that word is honor. We will honor families by expanding child care, and after-school care, and family and medical leave - so working parents have the help they need to care for their children -- because one of the most important jobs of all is raising our children. And we'll support the right of parents to decide that one of them will stay home longer with their babies if that's what they believe is best for their families. We will honor equal rights and fight for an equal day's pay for an equal day's work. And let there be no doubt: I will protect and defend a woman's right to choose. The last thing this country needs is a Supreme Court that overturns Roe v. Wade. We will remove all the old barriers -- so that those who are called disabled can develop all their abilities. And we will also widen the circle of opportunity for all Americans, and enforce all our civil rights laws. And we will honor the memory of Matthew Shepard, Joseph Ileto, and James Byrd, whose families all joined us this week -- by passing a law against hate crimes. We will honor the hard work of raising a family - by doing all we can to help parents protect their children. Parents deserve the simple security of knowing that their children are safe whether they're walking down the street, surfing the World Wide Web, or sitting behind a desk in school. To make families safer, we passed the toughest crime bill in history, and we're putting 100,000 new community police on our streets. Crime has fallen in every major category for seven years in a row. But there's still too much danger and there's still too much fear. So tonight I want to set another new, specific goal: to cut the crime rate year after year -- every single year throughout this decade. That's why I'll fight to add another 50,000 new police - community police who help prevent crime by establishing real relationships between law enforcement and neighborhood residents - which, incidentally, is the opposite of racial profiling, which must be brought to an end. I will fight for a crime victims' bill of rights, including a Constitutional amendment to make sure that victims, and not just criminals, are guaranteed rights in our justice system. I'll fight to toughen penalties on those who misuse the Internet to prey on our children and violate our privacy. And I'll fight to make every school in this nation drug-free and gun-free. Tipper and I went out to Columbine High School after the tragedy there, and we embraced the families of the children who were lost. And I will never forget the words of the father who whispered into my ear, "Promise me that these children will not have died in vain." All of us must join together to make that promise come true. Laws and programs by themselves will never be enough. All of us, and especially all parents need to take more responsibility. We need to change our hearts -- and make a commitment to our children and to one another. I'm excited about America's prospects and full of hope for America's future. Our country has come a long way, and I've come a long way since that long ago time when I went to Vietnam. I've never forgotten what I saw there -- and the bravery of so many young Americans. As a Senator, I broke with many in our party and voted to support the Gulf War when Saddam Hussein invaded Kuwait -- because I believed America's vital interests were at stake. Early in my public service, I took up the issue of nuclear arms control and nuclear weapons -- because nothing is more fundamental than protecting our national security. Now I want to lead America because I love America. I will keep America's defenses strong. I will make sure our armed forces continue to be the best-equipped, best-trained, and best-led in the entire world. In the last century, this nation more than any other freed the world from fascism and communism. But a newly free world still has dangers and challenges, both old and new. We must always have the will to defend our enduring interests -- from Europe, to the Middle East, to Japan and Korea. We must strengthen our partnerships with Africa, Latin America, and the rest of the developing world. We must welcome and promote truly free trade. But I say to you: it must be fair trade. We must set standards to end child labor, to prevent the exploitation of workers and the poisoning of the environment. Free trade can and must be -- and if I'm President, will be -- a way to lift everyone up, not bring anyone down to the lowest common denominator. So those are the issues, and that's where I stand. But I also want to tell you just a little more about two of my greatest heroes, my father and my mother. Then the Great Depression came along and taught him a lesson that couldn't be found in any classroom. He told me and my sister often how he watched grown men, with wives and children they could neither feed nor clothe, on farms they could no longer pay for. My father didn't know whether he could help those families -- but he believed he had to try. And never in the years to come - in Congress, and in the United States Senate -- did he lose sight of the reason he entered public service: to fight for the people, not the powerful. As Tipper told you tonight, we lost my dad a year and a half ago. But we're so lucky that my mother Pauline continues to be part of our lives, every single day. She's here tonight. Sometimes in this campaign, when I visit a school and see a hard-working teacher trying to change the world one child at a time -- I see the face of my father. And I know that teaching our children well is not just the teacher's job; it's everyone's job. And it has to be our national mission. I've shaken hands in diners and coffee shops all across this country. And sometimes, when I see a waitress working hard and thanking someone for a tip, I see the face of my mother. And I know: for that waitress carrying trays, or a construction worker in the winter cold, I will never agree to raise the retirement age to 70, or threaten the promise of Social Security. I say to you tonight: we've got to win this election - because every hard-working American family deserves to open the door to their dream. In our democracy, the future is not something that just happens to us; it is something we make for ourselves -- together. And I ask all of you, my fellow citizens: from this city that marked both the end of America's journey westward and the beginning of the New Frontier, let us set out on a new journey to the best America. Yes, we have our problems. But the United States of America is the best country ever created -- and still, as ever, the hope of humankind. Yes, we're all imperfect. But as Americans we all share in the privilege and challenge of building a more perfect union. I know my own imperfections. I know that sometimes people say I'm too serious, that I talk too much substance and policy. Maybe I've done that tonight. But the Presidency is more than a popularity contest. It's a day-by-day fight for people. Sometimes, you have to choose to do what's difficult or unpopular. Sometimes, you have to be willing to spend your popularity in order to pick the hard right over the easy wrong. If you entrust me with the Presidency, I know I won't always be the most exciting politician. If we allow ourselves to believe, without reservation, that we can do what's right and be the better for it -- then the best America will become our America.